What about the WAS though? I'm assuming the French will appear in that in all their glory. That's right. That's why I'am painting some elite troops. But if you want to be completely historical correct you can not use all austrian and french units for WAS and syw (because the uniforms changed a bit). I paint for WAS only. Noailles and his nephew met for a view of their forces. Gramont wants a baton for himself. To not Standing around without something in his Hand, he takes his glass. Noailles think: "What a fool! He is jealous and he knows that he don't become younger." The whole army. Most of the army was paint in 12 months since last february. About 2 dozens were painted by a professional painting service and 2 dozens by my wife. 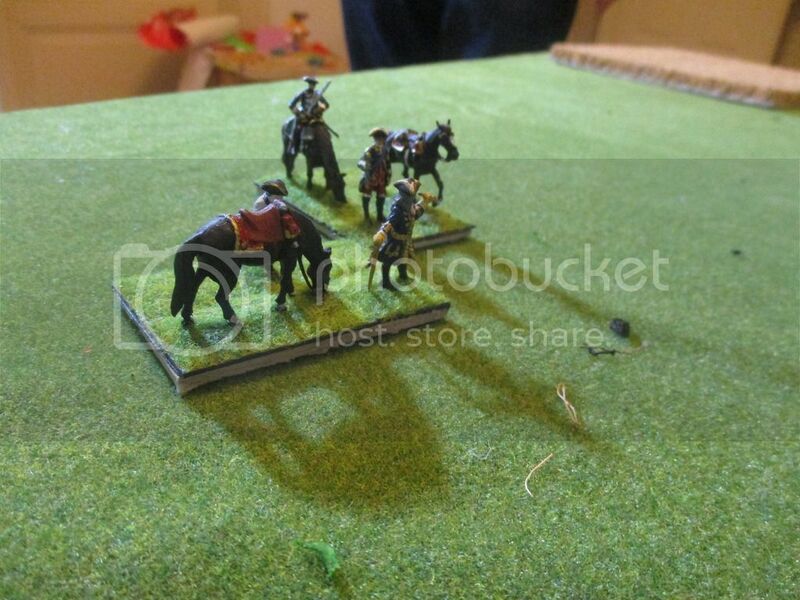 Elite cavalry on the left. They are positioned with the oldest and finest units in the first ranks. I like cavalry very much. And I really hate to paint guns. What a boring job! 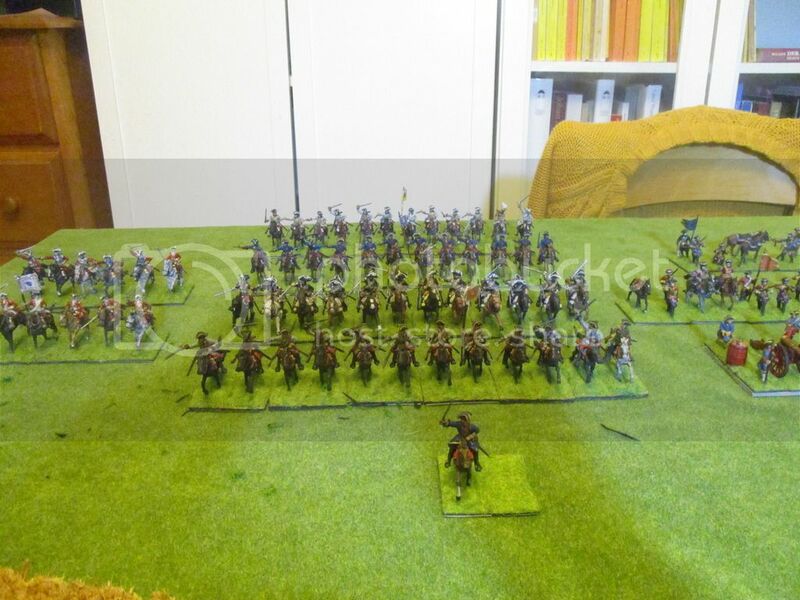 As you see better on this picture: I'm building up a second unit of dragoons. I think that I will not need more than 2 units. I'm very much pleased with my wild geese. Such colorfull units! An inspiring set of photos - very much the spirit of the period. It also looks as if you have an very nice wargames room. 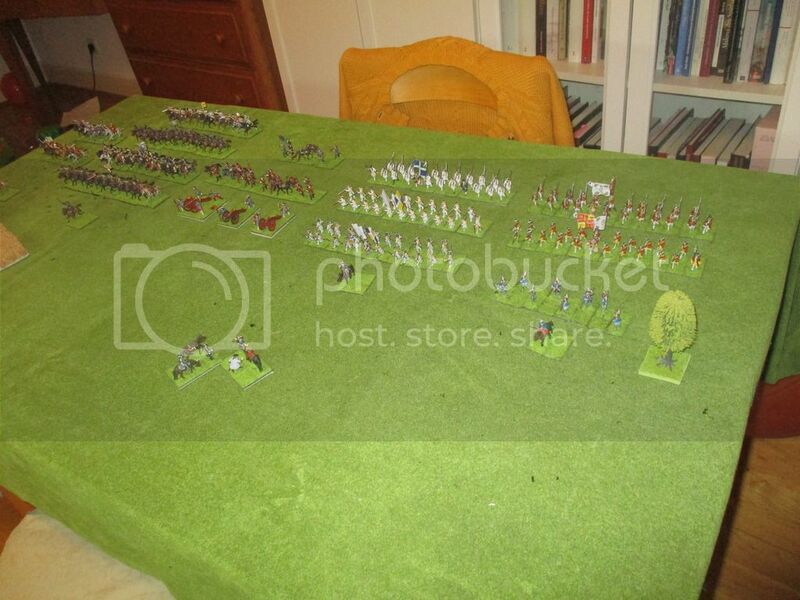 It's our living room and I use the diningtable for wargaming. It depends on the scale of battle. Sometimes I add the table from our kitchen, and some cheap pastingtables. Our living room is crowded with old weapons, 18th century prints (nothing really expensive, mostly from fleemarkets) and our harpsichord. Nice. I've managed to sneak in a couple of WW2 maps to our dining room, and one corner contains a print of the HoW cover art. And that's about it. Would love to collect some 18th century weapons but original items seem to be very expensive. 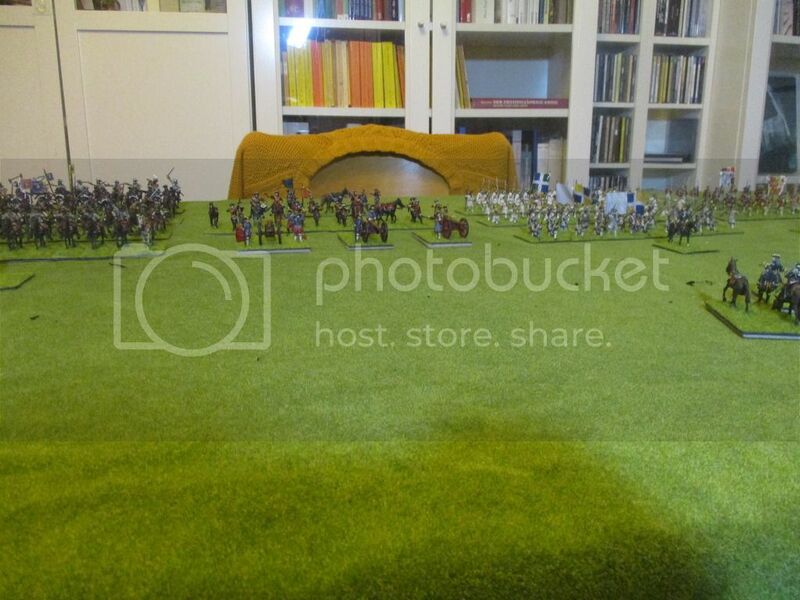 An excellent looking army, thanks for sharing. Now I finished painting the second bn. of my regiment Artois. As you may see I gave the figures the older uniform from around 1736 with the red waistcoat. One of the grenadiers lost his coat but has his waistcoat. Some of the soldiers still have the red stockings. The officer has leather breeches. In front of the batallions is the brigadier de Duras wearing his uniform from the régiment Auvergne. Similar to the 2nd. bn. of Artois I decided to paint the more colourfull version from the 1730s. You may recognize that I tried to make something different. I gave some figures a more lightly blue to show older uniforms. Fabulous work again Damnitz. 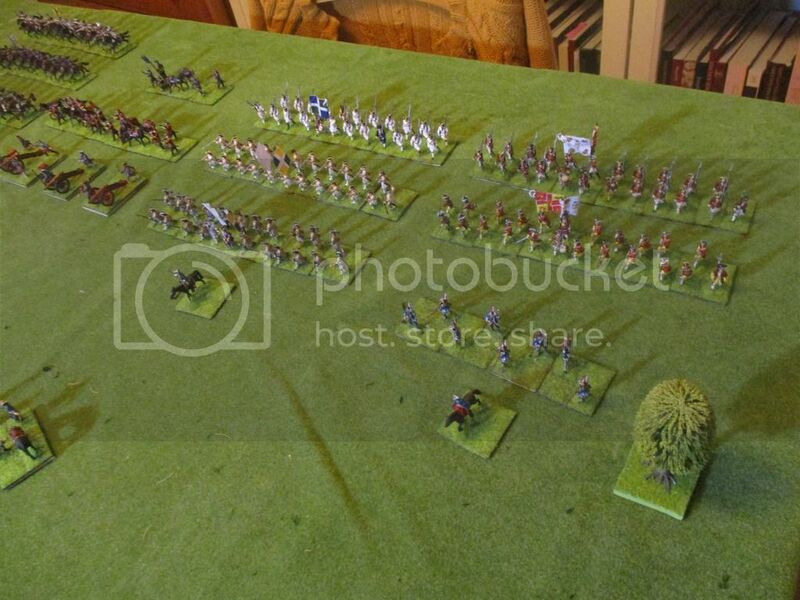 I also like plenty of cavalry on the table which is one reason why the mid-C18th appeals so much to me, but not the AWI. More infantry for my French army at least! Let me introduce to you my first batallion of the Régiment Navarre. In front of the unit you may see the commander: Jean-Victor, marquis de Mortemart. He was the commander of the regiment since 1740 and became the brigadier in 1743. 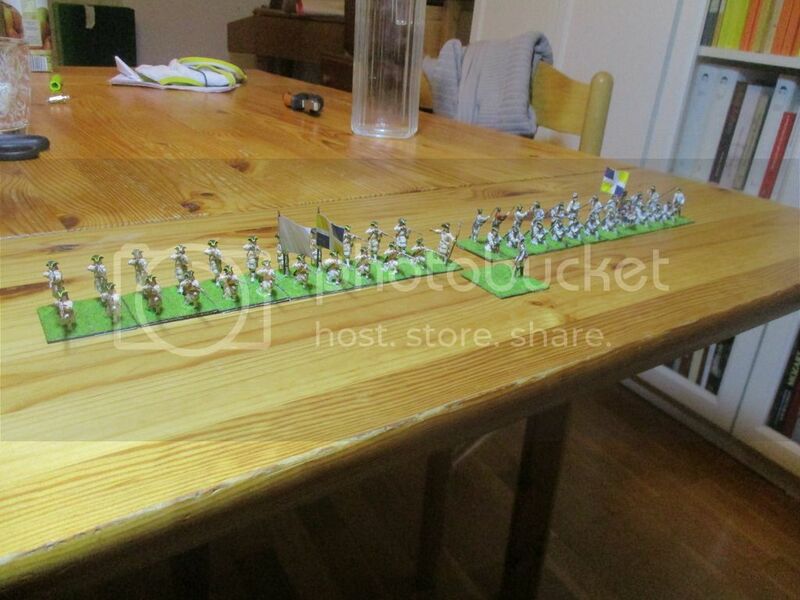 Figures are a mix of Revell (the brigadier with a new walking stick and the Grenadiers), Zvezda (all normal fusiliers) and the new command set from Imperial Modellbau (one of the Drummers, the officer and the flagbearers). Great to see your army all displayed, a very impressive sight! Our living room is crowded with old weapons, 18th century prints (nothing really expensive, mostly from fleemarkets) and our harpsichord. Ah, a harpsichord! One of my life ambitions is to own one in the future! Thanks for displaying your excellent army, very inspirational. 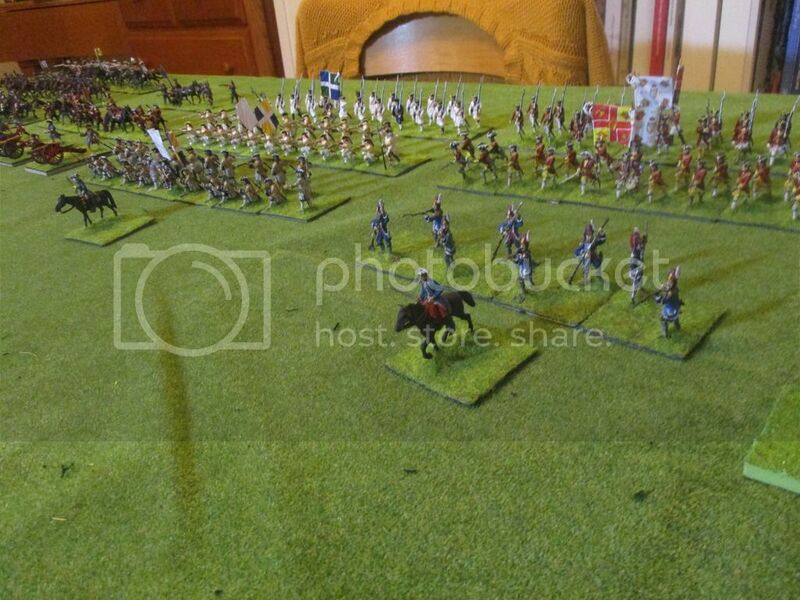 When I have completed several hundred 28mm figures I am going to finish my 20mm armies. Harpsichords are very inspiring instruments. Perfect for a small flat. Not too big for the livingroom and not loud. Nobody in our house ever recogniszed it when we played it. I hope to play it again when my kids don't occupy it every day when I want to play it. It's highly recommended to use drums. I have a small drum ( tambourin) which I use to play while I'm singing "british grenadiers", "Prinz Eugen" and all this 18th century stuff. Many thanks for all these kind comments. Now I've to buy more boxes for my new regiments. I hope you have enough of plastic figures. The prizes for Zvezda are not the same like 5 years ago. 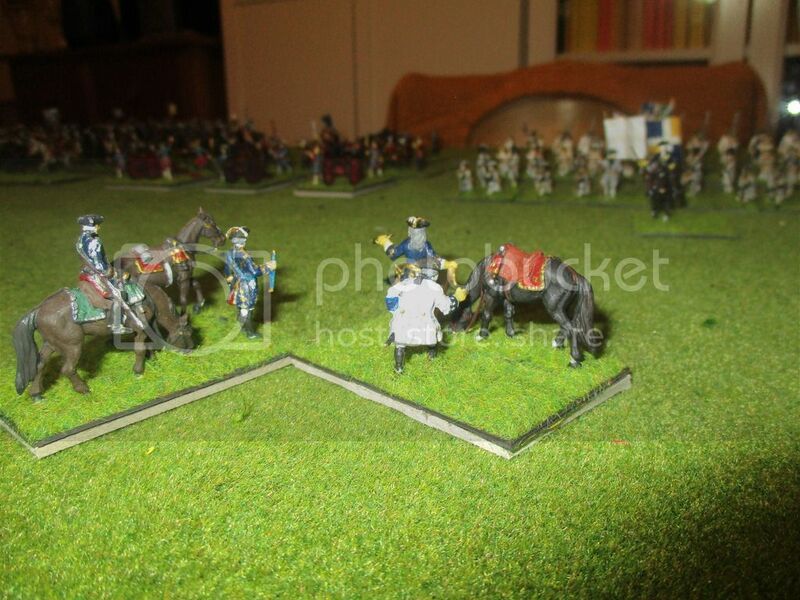 All sets were not longer produced and it's the same with redbox which I use for english and hanoverian infantry. I thought, that I would need such a canon for my Dettingen-Scenario. 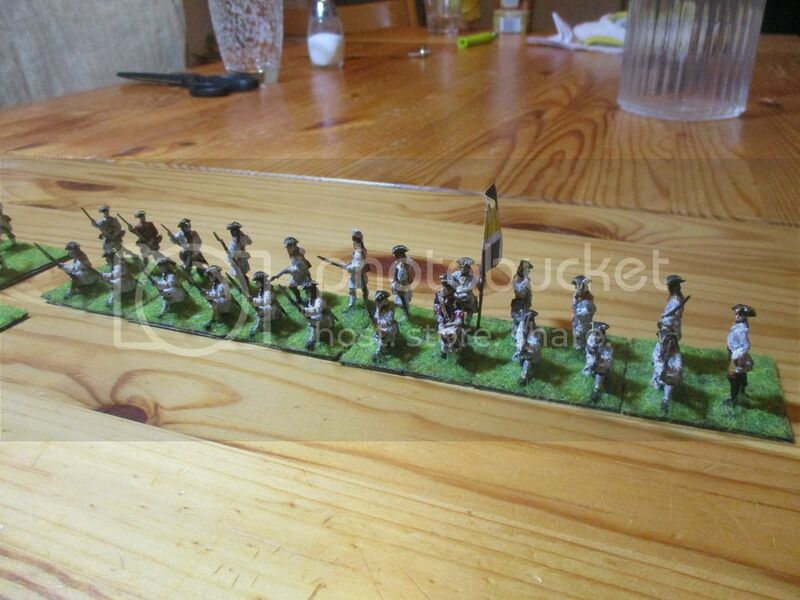 The 16lb-gun and crew are from Imperial-Modellbau (Hagen-Miniatures).